The Canucks and the Penguins could be eliminated with losses Wednesday. Which collapse do you find more surprising? The Penguins. It’s not that I necessarily assumed they would win — I thought it would be a back-and-forth slog of a series and Philly definitely had a chance — but I was NOT expecting them to just completely unravel. Evgeni Malkin, who scored 50 goals this season, has been almost invisible. Marc-Andre Fleury has melted down — the best stat I read was from TSN’s Scott Cullen, who said if Fleury had even a .900 save percentage (which isn’t even good by playoff standards) it would have been good for nine fewer goals against Pittsburgh in three games. It’s just gotten so ugly so fast, and I don’t think anyone saw it coming. Which teams are your favorites to win the Cup after seeing some first-round games? When people ask who I’m rooting for, I say that I just want every series to go seven games and end in overtime. (As long as the Rangers win all their Game 7s, obviously.) Anyway, earlier I answered this question and wrote that I’d give a good shot to whoever gets out of the Detroit-Nashville series. After Tuesday night, it looks like that will be the Predators. But if Jonathan Quick keeps playing the way he has it’ll be a huge asset to the Kings now that they’re scoring goals again. I’d secretly love to see a Kings-Philly Cup finals for the storylines alone. Please provide a clip and/or quote of your favorite post-game interview. That’s easy. Ilya Bryzgalov, “Why You Heff to Be Mad?” A modern classic. Runner-up, though: Jarome Iginla, “Setting Up the Play” (2:20 mark). Is there a grosser tradition than the Panthers rats? Because seriously, it weirds me out, and I think it’s probably worse than the octopi. so gross. 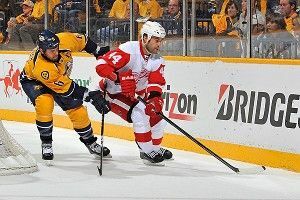 In Nashville the other day, someone threw down a catfish, and it really riled up octopus-tossing Detroit fans who saw it as intellectual property theft by the nouveau riche — next time the two teams are playing, do a Twitter search for “nashville” and “hillbillies” and you’ll see what I mean.